Ever had one of those great photos that you wanted to share or upload only to find out there was a file size restriction? Your grand photo was too big. Professional photographers and designers know how to get around these barriers, but for others, this can be a nightmare. Fortunately, there are some easy and free online resources that reduce image file size without sacrificing quality. Part of the problem is that digital cameras are getting better. But this means that the image file sizes can be very large. Recently, one viewer wanted to upload her images to a photo contest, but the site restricted the file size to 5mb per image. She wanted to know if there was a way to get her photo size reduced so she could submit her entries. There are 2 ways to solve this problem. Make the image smaller. For example, if the original image was 4000px x 2000px you could reduce it to 2000px x 1000px. You probably want to keep the same aspect ratio. Use a compression routine to remove extra data. Certainly, there are a number of software packages that can do the above steps like Adobe PhotoShop or GIMP. However, they often come with a learning curve or expense. 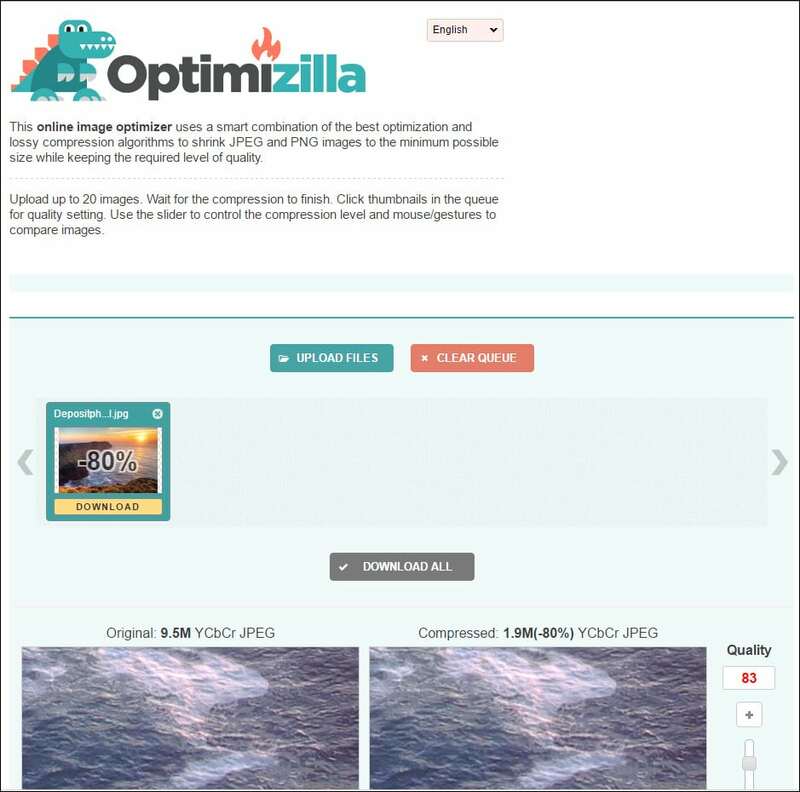 Instead, you can use one of the free websites (web applications) that offer image compression. The end results will be a much smaller photo image file but at the same dimensions. When looking at these services, I had some requirements in mind. In many cases, this info was on the website. However, there were some services that didn’t address these issues. To test the services, I used a stock image that weighed in at 9629KB according to Windows File Explorer. My math was based on original file size and resulting file size. In some cases, the online services showed different values. This is also a reminder that you shouldn’t rename your compressed images the same name as your original. Always keep your original files as you may want to test various services. The original photograph, in the red outline, was 4500 px X 3000 px. Once I finished testing, I opened Windows Photo Viewer to see if I could notice visual differences between the files. From my perspective, the original and compressed images looked the same. I didn’t see any washed-out colors. 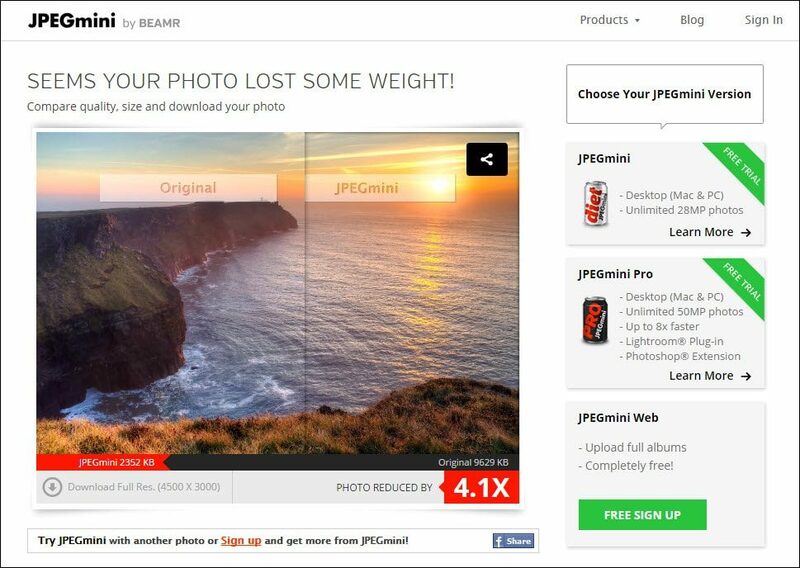 What I liked about JPEG.IO was the simple design. Although I was focusing on JPG images, I surprised to see so many supported image file formats including WebP. 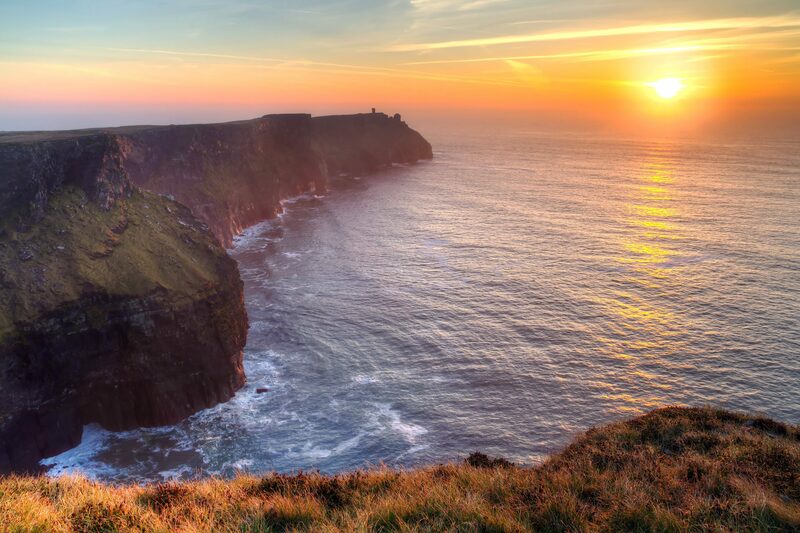 This is a relatively new image format created by Google. It also allowed you to import images from 3rd party storage services like Dropbox, Google Drive, and Box. Although you can’t see the full image until you download the file, I could see a thumbnail when I hovered over the button. What I disliked was that there was very little information about the site and service. There was a lone pop-up dialog I could see which told me the service used Kraken.io proprietary technology. Kraken.IO is well-known for image compression and tools. I’ve used their paid services in the past with great success. From the domain registration, I thought JPEG.IO might be owned by the same company. However, I never got a response to my email inquiry. The service did reduce the picture from 9.6mb down to 3.56mb (37%). The version looked just as good as the original. JPEGMINI is a robust service that has a suite of products ranging from software to servers. In my case, I used the UPLOAD PHOTO button under the main image on the homepage. 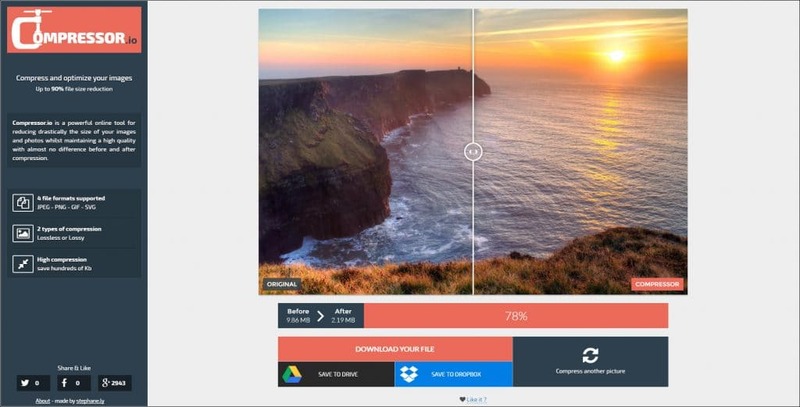 The service claims to reduce file size by 80% without compromising quality. What I appreciated about the service is they provided a detailed FAQ section and a separate page explaining their patent-pending photo recompression technology. 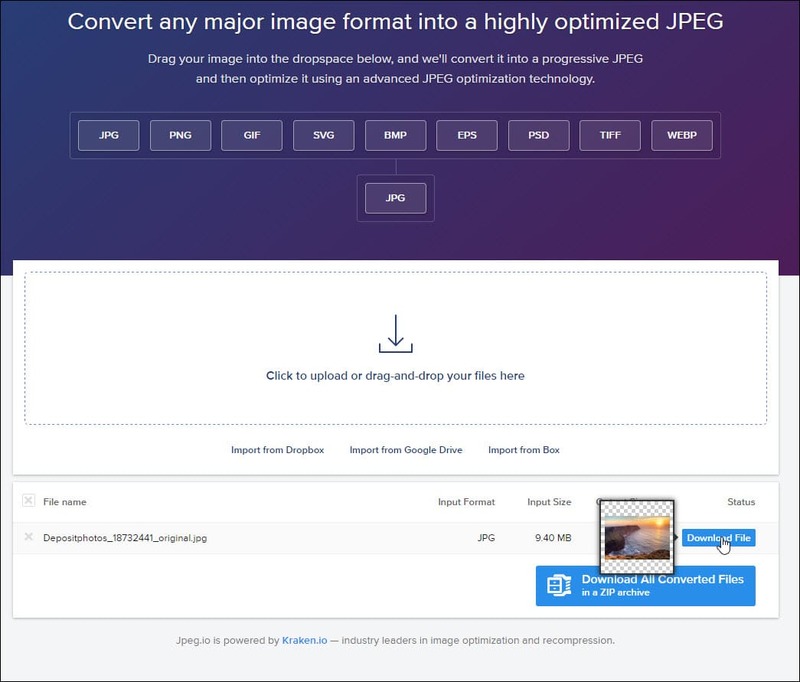 It told me things like whether they remove EXIF data and that the file savings would be dependent on the size, resolution, and quality of the original image. Once the compression process was done, you could see your image online alongside the compressed version. There is a slider you can use to drag over the image for comparison purposes. They also state how much the photo was reduced. In this test, the file was reduced 4.1x. It was 24.4% the size of the original. Interestingly, the service maintained the original file date. Optmizilla didn’t seem as polished, but I learned it is feature rich. They clearly state the JPG or PNG files you upload will delete in 1 hour. There were two items that stood out. The first was they offer different language options other than English, which I thought was a nice touch. They also allowed me to use a slider to adjust the image quality. This is something you might see in desktop software. I didn’t see this feature offered with the other web applications. The output examples of the before and after images wasn’t as large as other services and contain an inset. I’m guessing when the initial thumbnail loads, it’s using the center of your image. You can click the image and locate a more important part of the photo for comparison. The service reduced the file size the most bringing it down to 20.1% of the original size. As with the other services, the compressed image looked fine to me. You can also save your new image file to DropBox or Google Drive. One feature I didn’t see on the other sites was the ability to choose from Lossy and Lossless compression. The service does have a stated upload file size of 10mb. The only “glitch” I ran into was I couldn’t save to Google Drive. Each time I hit the button, the contents would shift. This didn’t happen with the DropBox button. If I needed to upload to Google Drive, I could still do it manually. I think all these services did what they advertised and would feel comfortable using any of them with the exception of JPEG.IO. The output was fine, but I’m reluctant until I know more about the service. If I get a response to my inquiry, I’ll update this article. One item to remember is that these results can vary based on the image. In this test, I was only using 1 image and not a set containing varying colors, sizes, and resolutions. As the saying goes, “your mileage may differ”.